A Cold War narrative of superpower showdowns, media suppression, and two escape tunnels beneath the Berlin Wall. ...[a] thrilling and meticulously documented account ... Mitchell masterfully guides the reader through a labyrinth of details, intertwining the narratives to show how the tunnelers, the NBC crew and the politicians played their parts on the stage of history ... Mitchell has written a fitting tribute to the brave men and women who did all they could to tear down that Wall. Mitchell could have written a light riff with such strange, satire-ready material, but he has chosen a serious approach. Lengthy forays into transcripts of President Kennedy’s deliberations with his advisers provide context but drag in places, as do accounts of the drudgery of long hours in damp underground passageways. But Mitchell quickly wins the reader back with his tense descriptions ... The greatest strength of The Tunnels is in the details ... For those who see walls as the answer to policy problems, this book serves as a stark reminder that barriers can never cut people off entirely but only succeed in driving them underground. The book vividly describes the harrowing conditions under which strong young men based in West Berlin dug the tunnels ... Mitchell’s interviews with the tunnelers, couriers and escapees put a human face on this dramatic experience ... The political and media angles in The Tunnels are indeed intriguing, but the tension between rival journalists pales in comparison to what the refugees and their helpers were risking. Moreover, much of Mitchell’s narrative rotates among a broad array of characters. This complex account involves too many characters to keep track of or feel emotionally attached to ... The intense drama and risks involved for the tunnelers and the escapees offer a compelling context for today’s refu­gee crisis. 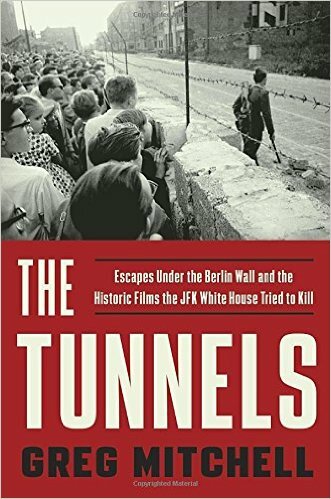 What did you think of The Tunnels: Escapes Under the Berlin Wall and the Historic Films the JFK White House Tried to Kill?